How to foster the role of SMEs in bioenergy for innovation and growth in rural areas? The Horizon 2020 project ‘SecureChain’ promoted sustainable supply chains of SMEs in bioenergy that meet highest environmental quality and financial viability standards. The results were recently presented at a final conference held on June 7, 2018 in Brussels. The main objective of the project was to roll out a dedicated mentoring approach for SMEs in order to facilitate the mobilisation of biomass and market uptake of most efficient systems. The project united competent partners in biomass, energy efficiency, sustainability, certification and green investment and targeted stakeholders in six European model regions, such as SMEs, energy agencies, cluster organisations and research centres. Innovation vouchers: In an open contest, SMEs could apply for specific support of their own proposed pilot projects. The best pilot projects were selected and received hands-on technical advice from the project team. Regional Lead Partners were the main contact point for SMEs and ensured region-specific oversight and quality control of the pilot projects’ implementation. Learning Labs and various trainings were offered to raise capabilities of SME owners and to ensure wider stakeholder engagement in the regions. Sustainability checks. Life Cycle Assessments (LCA) were carried out to evaluate the environmental impacts of SME pilots. Trainings and pre-checks helped SMEs to prepare successfully for certification. Financial risk assessment and advisory services to SMEs facilitated strategic business decisions and new investments into facilities and equipment. 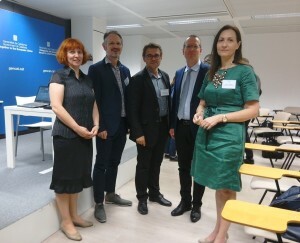 A moment from the SecureChain Final Conference, 7 June 2018 in Brussels (from right to left): Maria Georgiadou, DG Research and Innovation of the European Commission; Uwe Kies, InnovaWood; Göran Gustavsson, Energikontor Sydost; John Vos, BTG Biomass Technology Group; Lesya Loyko, FORZA Agency for Sustainable Development of the Carpathian Region. which offered tailored advice and support for each individual pilot. To ensure participation of more SMEs and other market actors, the project organised a series of regional outreach activities. The Learning Labs included meetings and workshops to sensitize local stakeholders about sustainable biomass use and bioenergy. SME owners presented their pilot projects together, allowing for regular feedback on the progress and impulses from other SMEs, experts and stakeholders. The following are a selection of successful collaborations of regional SMEs, consultants and public stakeholders to implement pilot projects. Värnamo Energi AB, Sweden. Biomass mobilisation through conversion of municipal heat plants. 14 small oil boilers in four villages are being replaced by four new biomass systems and an expansion and renewal of the district heating grid. The pilot investigated the optimal technical solution to supply heat to these communities and the interest of the potential local customers. Novalia Sinergie, Catalonia, Spain. Upscaling of wood pellet production. The company enlarged their production by adding an extra pellet line for industrial pellets. The pilot was used to develop a commercial strategy and secure the funding for the enlargement. Furthermore, they obtained a certification for the domestic pellets. AVEA GmbH & Co. KG, Germany. Improved wood recovery from green wastes. A communal waste management company improved its green waste sorting process to make the underutilised wooden fraction accessible for thermal utilisation. The pilot helped to enlarge the capacity of the biomass yard and reduced greenhouse gas emissions per ton of green waste significantly. Bruins & Kwast Biomass Management, The Netherlands. Biomass mobilisation from landscape elements. The pilot included two companies, a municipality and a landscape management organisation, which aimed to select the optimal method for maintenance of a traditional cultural landscape with high ecological value. The pilot proved the feasibility under certain conditions and will be pursued in a follow-up demonstration project. Sustainable bioenergy projects are challenging for SMEs, because various business and environmental aspects along the supply chain play a role. SecureChain developed and tested the mentoring approach within a variety of companies and regional settings. Not every pilot project is a success story, but it increases the knowledge of the pilot owner and the involved stakeholders. An ex-post evaluation of the SMEs’ experience showed significant appreciation, especially of the networking activities. 70% of SME pilot project owners indicated that they had taken concrete actions based on their involvement in SecureChain. SMART performance criteria indicated that the pilot projects mobilised around 142,000 tons of biomass/year, a final renewable energy production of 2.3 million GJ/year and triggered investments of 10.2 million EUR. The successful results show the potential of this method as a recommendable, transferable practice for support of market uptake by SMEs. The main project results have been already published in a summary report, which includes also a collection of 15 pilot project factsheets. The report and all conference presentations are accessible at www.securechain.eu/conference. The project has received funding support from the European Commission Horizon 2020 under grant agreement no. 646457 from 01/04/2015 – 31/07/2018. It was coordinated by the BTG Biomass Technology Group BV in Enschede, The Netherlands.